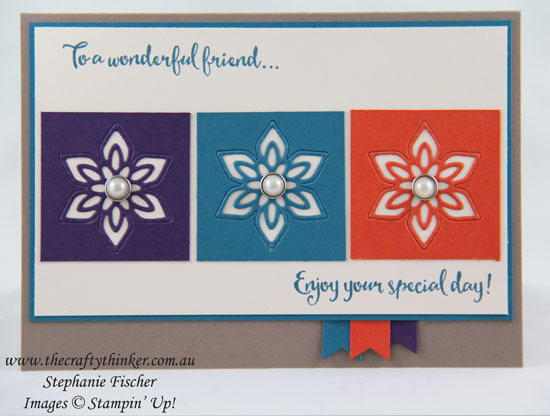 Welcome to the Crazy Crafters' Blog Hop with our Special Guest stamper, Janneke de Jong - we are thrilled to have Janneke join us this month and so excited to CASE (Copy And Selectively Edit) any project that has been created by her . After much deliberation, I chose this card of Janneke's to CASE. I have make a few alterations to the layout but the principle is the same. The base card is Tip Top Taupe to which I added layers of Island Indigo and Whisper White, with some little banners of Island Indigo, Elegant Eggplant and Tangerine Tango peeking from the lower edge. I cut 1.75" squares of the same colours and cut a flower from the centre of each with one of the Flourish thinlits. The flowers are finished off with a Metal Rimmed Pearl to the centre. The greetings are from the Dragonfly Dreams stamp set. 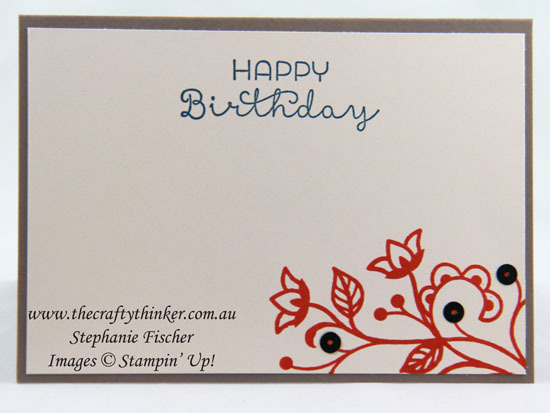 The inside panel is decorated with one of the matching Flourishing Phrases stamps (Tangelo Tango ink) and the birthday greeting (Island Indigo) is from the Cottage Greetings stamp set. For a little more interest, I added some Bermuda Bay sequins from the Sequin Trim.